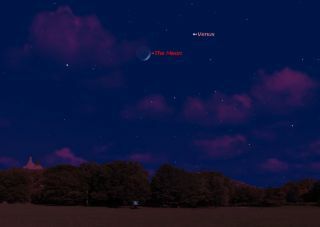 This sky chart shows the location of Venus and the crescent moon in the western night sky on May 21, 2015 as they will appear at 9 p.m. local time to observers at mid-northern latitudes. On Thursday evening (May 21) as darkness falls, the two brightest objects of the night will be calling attention to themselves in the western sky. Thecrescent moon will be accompanied by the brightest planet, the dazzling so-called "evening star": the planet Venus. Venus and the moon will not be particularly close to each other, but weather permitting, the celestial pair should make for a stunning night sky scene. Venus will appear to hover roughly 8 degrees to the moon's upper right (your clenched fist held at arm's length measures about 10 degrees). The moon, meanwhile, will be just 16-percent illuminated as a slender crescent. Yet, even though they're not overly close, their brightness forces even those who normally do not pay much attention to the sky to look up. Which object shines brighter? It might seem that Venus glows more brightly than the slender lunar sliver, but in truth it is really the moon. It shines at a magnitude-8.3, which is nearly 44 times brighter than Venus (shining at magnitude -4.2). What makes Venus more brilliant is probably due to the fact that its brightness is concentrated into a point of light to the eye, while the moon is considerably larger in angular size and its brightness is thus spread out over a larger area. Look also for Earthshine; sunlight that is reflected off the Earth and directed toward the moon. That reflected light from the Earth is what is dimly illuminating the dark part of the moon with a grayish-blue light, almost imparting a three-dimensional effect to the moon particular in binoculars or a small telescope. Currently, Venus is near the pinnacle of its evening visibility. By the end of May, it will begin to slide back toward the sun. Right now it is setting about three and a half hours after sunset. By mid-June, that difference will be reduced to three hours, and by the end of June it will be down to two and a half hours. By the second week of July, Venus will be setting before the end of evening twilight, and by the end of July, it will be setting less than an hour after sunset. Venus will be gone from our evening sky by early August. So enjoy it now, and especially on Thursday when it will make for a lovely sight with our moon. Editor's note:If you snap a great photo of Venus and the moon, or any other night sky scene, and would like to share it for a potential story or gallery, send images and comments in to Space.com at: spacephotos@space.com.